The enduring nuclear weapon stockpile contains twelve systems within eight weapon classes. The W84, which is in the inactive stockpile (IS), is also listed. It's carrier, the ground-launched cruise missile, was eliminated by the Intermediate-Range Nuclear Forces Treaty of 1988. The 2001 Nuclear Posture Review indicated that the inactive stockpile will consist of warhead types in the active stockpile plus the W84 and B83 Mod 0, which have no active stockpile counterparts. In November 2001 President Bush announced his intention to reduce the United States' operationally deployed strategic nuclear warheads by some two-thirds -- to between 1,700 and 2,200 weapons. As of September 2013, the U.S. stockpile of nuclear warheads consisted of 4,804 warheads [several thousand additional nuclear warheads were retired and awaiting dismantlement.]. As of September 2014, the U.S. stockpile of nuclear warheads consisted of 4,717 warheads. Approximately 2,500 additional nuclear warheads are currently retired and awaiting dismantlement. 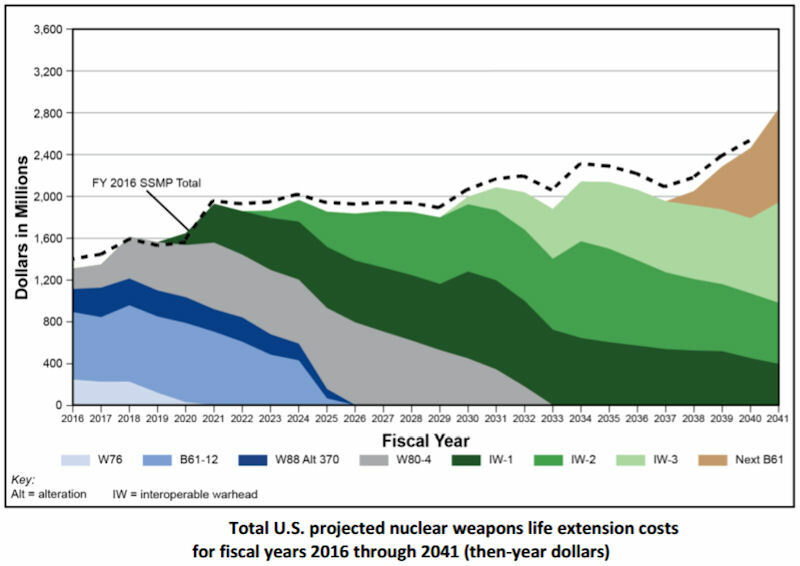 From fiscal years 1994 through 2014, the United States dismantled 10,251 nuclear warheads. Since September 30, 2013, the United States has dismantled 299 nuclear warheads. This number represented an 85 percent reduction in the stockpile from its maximum (31,255) at the end of fiscal year 1967, and a 78 percent reduction from its level (22,217) when the Berlin Wall fell in late 1989. The size of the US nuclear stockpile as of September 30, 2015 was 4,571 weapons -- and 109 US nuclear weapons were dismantled in FY 2015. The National Nuclear Security Agency (NNSA) is pursuing a warhead modernization plan known as the “3+2 Strategy”. 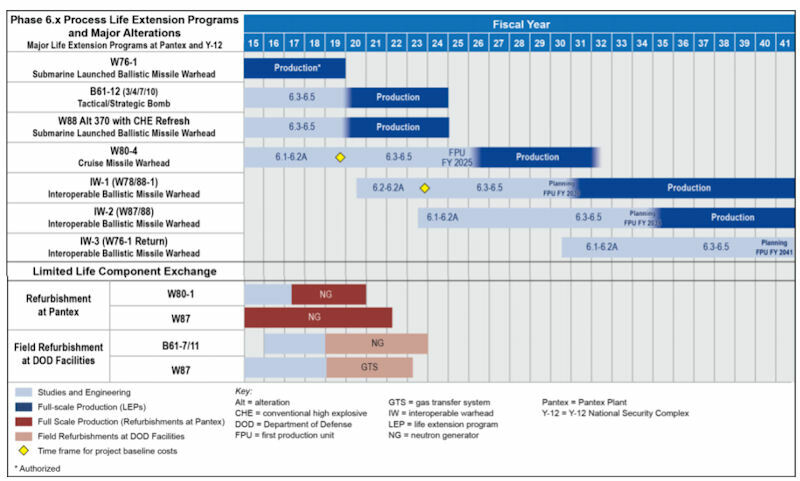 NNSA is consolidating the US warhead arsenal into five variants. Five bomb and cruise missile warhead types are being consolidated into two replacement warhead designs, the W80-4 and the B61-12. And the five ballistic missile warheads now in service are being consolidated into three new interoperable warheads known as the IW-1, IW-2, and IW-3. 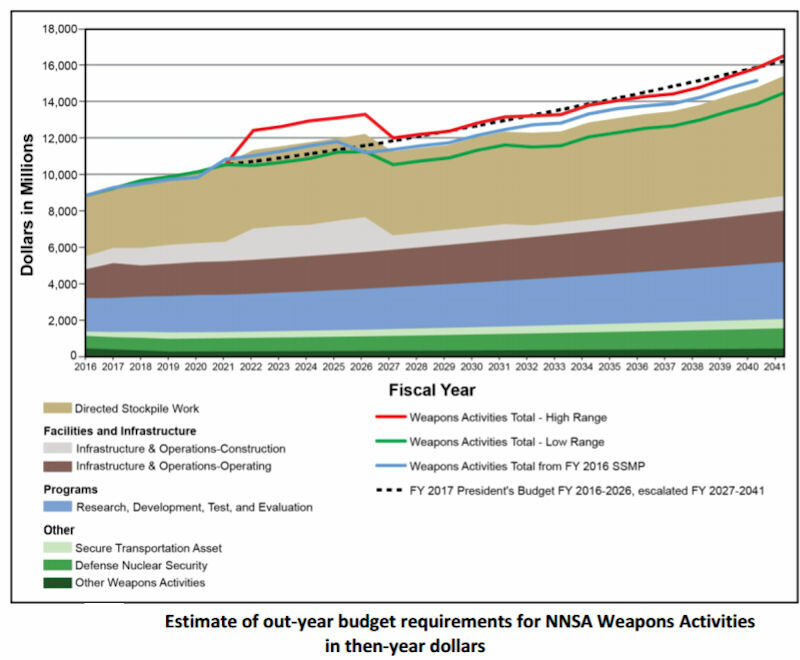 The Stockpile Stewardship and Management Plan (SSMP), the 25-year strategic program of record that captures the plans developed across numerous NNSA programs and organizations to maintain and modernize the scientific tools, capabilities, and infrastructure necessary to ensure the success of NNSA’s nuclear weapons mission. The SSMP is a companion to the Prevent, Counter, and Respond: A Strategic Plan to Reduce Global Nuclear Threats report, the planning document for NNSA’s nuclear threat reduction mission. New versions of both reports are published each year in response to new requirements and challenges. In a speech 12 January 2017 at the Carnegie Endowment for International Peace, Vice President Joe Biden announced that over the past year, the United States moved almost 500 weapons from the active stockpile of deployed and reserve weapons into the dismantlement queue — a reduction of roughly ten percent. The Obama administration cut the number of weapons in the stockpile by 553 warheads since September 2015. That put the active nuclear stockpile at 4,018 warheads in service and approximately 2,800 in line to be destroyed. Since 2009, the United States had dismantled 2,226 nuclear warheads.